The Intersect tool in SolidWorks 2013 is very powerful with many different uses. In the following exercise, we’ll use Intersect to quickly create a filled volume from negative space in order to determine the amount of liquid in a bottle. The fill volume can then be quickly adjusted based on updates to the bottle. All of this can now be done without the use of the Cavity tool or Assembly files. 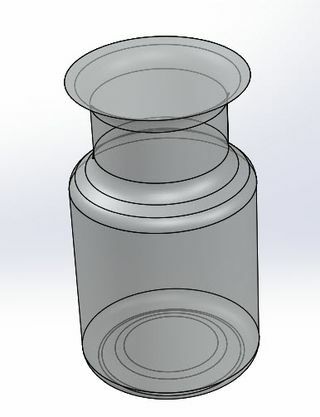 Open a part file of a bottle similar to the one in this example (above). Place a plane at the fill line. Start the Intersect tool (available on the Features tab of the CommandManager). 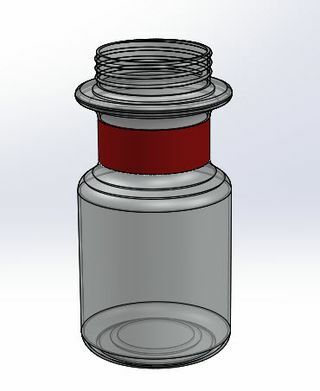 Select the body of the bottle, plus the fill line plane. They are added to the Selections box of the Intersect tool PropertyManager. Choose Intersect button that becomes active below the Selctions box. Note three regions are created. De-select “Merge Result” in the Options group box since you do not want to combine the fill volume with the bottle itself. Choose OK (green check mark button). You now have 3 solid bodies in your model. One is the fill volume. The other two are of the bottle being split by the fill line plane. You can use Combine to re-unify the two bottle bodies, but it is not necessary for this exercise. 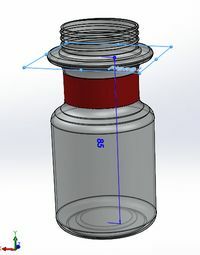 It is now possible to make changes on the bottle and immediately see the result on both the model and the fill volume. You can also view separate states of the model to highlight various elements. Let’s edit the Intersect feature to accomplish this. Right-click on the feature in the Feature Tree and select Edit Feature in the Short Cut Menu. Choose OK to accept and apply. Now you have a model of just the fill volume. Edit the Intersect feature again. Use the Invert Selection button under the Regions to Exclude. Choose OK to accept and apply. Now you have a model of just the original bottle, but with easy access to fill volume if you need to see it again.